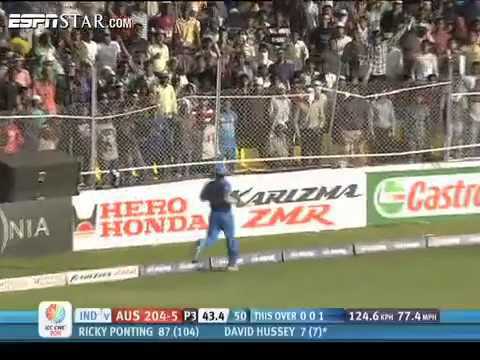 Watch 2nd Quarter Final Australia vs West Indes ICC Cricket World cup 2011 match Video Highlights. 2nd Quarter Final Australia vs West Indes match video highlights will be placed below soon after live broadcast of match. India beat Australia by 5 wickets in a thriller. Superb half-centuries from Sachin Tendulkar, Gautam Gambhir and Yuvraj Singh helped India register an exciting win as they chased down 260 successfully. Some blistering shots from Sachin Tendulkar, Yuvraj Singh and Suresh Raina saw India register a thrilling 5-wicket win against Australia. Tendulkar started in style with a four and Yuvraj finished in similar hitting a four. Yuvraj Singh grabbed his fourth Man of the Match award for his match-winning half-century and two wickets. Yuvraj remained unbeaten on 57 to take India to a 5-wicket win. Sachin Tendulkar struck a marvelous half century to provide a good start and stability to Indian innings after Virender Sehwag departed early. Tendulkar hit 53 off 68 balls which included seven fours. Brad Haddin scored 53 off 62 balls which included six fours and a six. Haddin was looking to hit over the rope when Suresh Raina took a good low catch. Dont forget to watch video highlights of the match which is played between India & Australia teams?